The movie Angels and Demons: trailer, clips, photos, soundtrack, news and much more! Not sure he’s sincere but I don’t give a dam (my grandmother do though, and will boycott Angels and Demons…): I just know that Angels and Demons looks like an entertaining movie! Inspector Olivetti (Pierfrancesco Favino) arrive to find a fire inside the church. 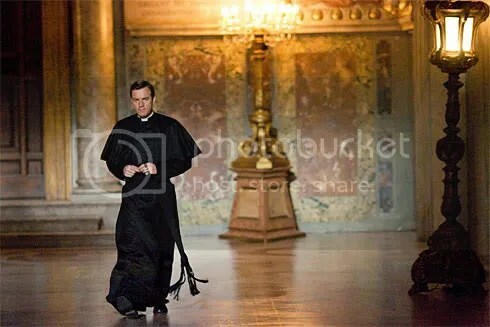 Camerlengo (Ewan McGregor) pleads with the Cardinals to go public. 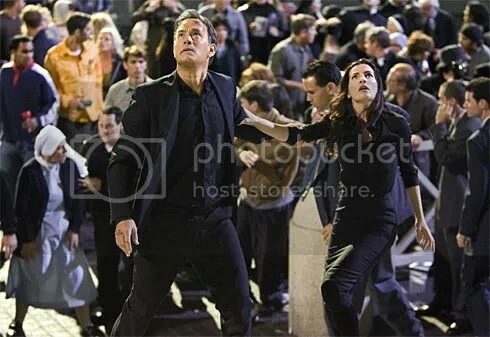 Robert Langdon (Tom Hanks) and Vittoria Vetra (Ayelet Zurer) rush to deliver a warning. Robert Langdon (Tom Hanks) and Chartrand (Thure Lindhardt) are locked in an air-tight vault. Regular movie audiences will probably enjoy the movie Angels and Demons, but I can understand that over-sensitive believers may frown upon Ron Howard’s movie. The two posters above were to be displayed on buses in Paris but it seems that the bus company is refusing those fearing a backlash from Catholic groups. Bad buzz good buzz! Angels and Demons will be released on May 15, 2009. Robert Langdon (Tom Hanks) works to convince Richter (Stellan Skarsgard) that he needs access to the Vatican archives. Vittoria Vetra (Ayelet Zurer) explains to Robert Langdon (Tom Hanks) and Richter (Stellan Skarsgard) the danger of the threat against the Vatican. Robert Langdon (Tom Hanks) and Vittoria Vetra (Ayelet Zurer) find a clue in a room of statues. Do you think that this movie sequel will perform as well as the first Da Vinci Code movie? Those two posters of Angels and Demons are full of mystery: they look damn great! Angels and Demons will hit theaters on May 15, 2009. Anyway, Angels and Demons still looks appealing but must say that Tom Hanks’ performance accounts for a lot for this! In Angels and Demons Harvard symbologist Robert Langdon tries to stop what seems to be the Illuminati, a legendary secret society, from destroying the Vatican City with the newly-discovered power of antimatter. On May 15th Tom Hans is gonna save the Vatican from the Illuminati! Tom Hanks is going to run for God’s sake during the Superbowl 2009. A movie trailer of Angels and Demons has been allotted a slot indeed. 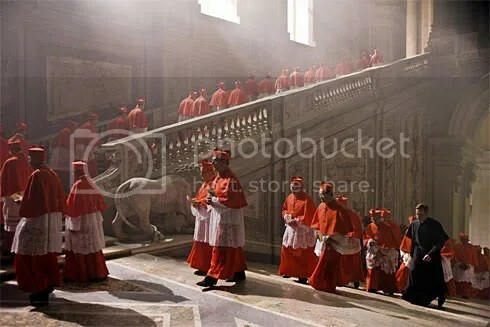 In this prequel to the Da Vinci Code Robert Langdon travels to Rome and the Holy See to investigate a murder linked to the Illuminati, a mysterious religious order that was thought disbanded centuries ago. Don’t miss the Superbowl trailer of Angels and Demons! This statue would be damn fine in my garden! But better to keep it in Rome. In Angels and Demons Robert Langdon (Tom Hanks) is investigating on a murder that may be linked to the Illuminati order, a secret society. Will RobertLangdon find who is behind the mysterious Illuminati? Will he save the Vatican? Shall see in ay 2009. Or if you can’t wait, read the book (which is a prequel to the Da Vinci Code). Well i enjoyed the Da Vinci Code. And I’m quite impatient to see Angels and Demons because it also combines sci-fi (with anti-matter!) and religion! Angels and Demons is starring Tom Hanks as Robert Langdon who is investigating a curious murder that will lead him to the Holy See in Rome. An other book written by Dan Brown is being adapted to the cinema: Angel & Demons, the prequel to the Da Vinci Code is indeed under production. And Tom Hanks is back as Robert Langdon. This new movie is almost sci-fi with a plot involving both Holy See and antimatter!